They just refuse to lose. Climbing out of an 11-point hole Saturday in the last 9:25 of the second half, the Butler Bulldogs went on to defeat the Florida Gators in overtime by a final of 74-71. The victory sends them, for the second year in a row, to the Final Four. 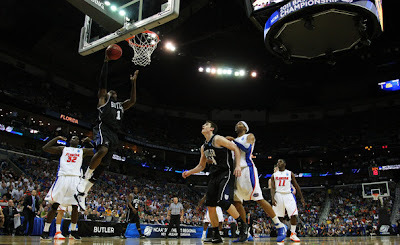 Shelvin Mack led the way for the Bulldogs scoring 27 points, including 5 in overtime. Other contributors included Matt Howard who dropped in 14, and Khyle Marshall who added 10. Butler has now knocked out three higher seeds from major conferences in succession. The #1-seed Pittsburgh Panthers, the #4-seed Wisconsin Badgers, and now the #2-seed Gators. Those wins all coming after Matt Howard tipped in the game winner at the buzzer against the Old Dominion Monarchs in the Bulldogs opening tournament game. I've officially jumped on the Butler bandwagon. How can you not? These guys just have a knack for finding ways to win. The next obstacle in their path will be either the #1-seed Kansas Jayhawks, or the #11-seed Virginia Commonwealth Rams. At this point, I doubt they even have a preference. In the other Elite Eight game on Saturday, it was the Kemba Walker-led Connecticut Huskies advancing to the Final Four by eliminating the Arizona Wildcats 65-63.